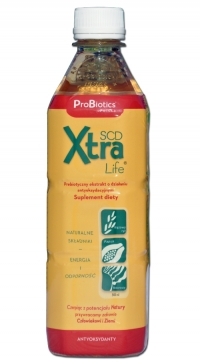 SCD Xtra Life® was created as a result of carrying out selective fermentation of organic rice bran, organic brown rice, papaya and organic kelp using SCD Probiotics Technology, and then filtering the liquid at 50 to 0.3 microns. Selectively fermented ingredients improve the activity of beneficial microbes of the gastrointestinal tract. Natural brown rice and rice bran are among the richest sources of vitamins, minerals and antioxidants found in the natural environment. They contain, among others, vitamin A, vitamin B complex, vitamin E, folic acid, biotin and oryzanol. Papaya fruit contains amino acids and vitamins. Papaya is a nutritious tropical fruit of the melon tree (Carica Papaya). Organic kelp is a seaweed that has been an essential component of the diet of coastal communities for many years. It is a source of easily digestible protein, unsaturated fatty acids, vitamin B and beta-carotene. 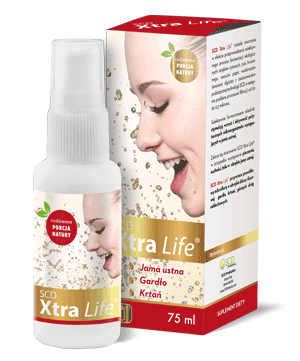 SCD Xtra Life® is an extract containing a complex of easily absorbed antioxidants, vitamins, minerals, enzymes, amino acids and compounds of plant origin. As a result of the natural processes occurring in SCD Xtra Life® slight changes in color, smell and taste may occur, as well as ingredient settling on the bottom may appear. This does not influence the effectiveness of the product. Do not exceed the recommended daily serving size. Purified and structured, unchlorinated water, rice bran extract, natural brown rice extract, papaya fruit, natural kelp, SCD ProBio Food®.